The most important component of any strainer or filter is the screen or filter basket/element which carries out the process of removing contaminant from the process fluid. The most important characteristic of the screen or filter basket is the effective filtration area the unit offers, the more the better. The open free area of the screen/basket will depend on and vary with different mesh sizes since meshes have different open area percentage characteristics. 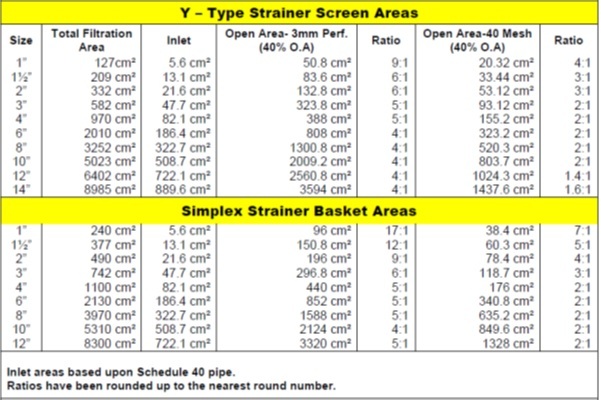 It is vital the overall open free area of the screen/basket is at least equal to the area of the pipe inlet to the unit. Generally, it is accepted that a good basket strainer should have an open to inlet free area ratio of at least 3 to 1. That is the total open free area is three times that of the inlet area. Filter elements must not exceed recommended face velocities. To decrease the face velocity, increase the filtration area. The construction of the screen or basket element is also of extreme importance. Screens and baskets are manufactured from perforated plates and meshes with a wide range of opening sizes to suit individual process needs. Perforated plates can be supplied with varying open area percentage values, we have already seen that the higher the value the better, however, there is one draw back in that the structure is weakened with increasing open area. Perforated plates with more than 50% open area should be avoided since they will become too weak to provide adequate mechanical support, percentage areas of between 37 and 46% are the norm. The pore size or aperture should be slightly smaller than the minimum particle size to be removed. Under no circumstances should the pore size or aperture be bigger than the minimum particle size, also much smaller apertures should be avoided since this will clog the element more quickly and reduce service life. The overall construction of the element must be robust and rigid in order to withstand pressure fluctuations, mis-handling and to provide a reasonable resistance to differential pressure which will try to either burst or buckle the element depending upon the direction of the fluid flow through it. Perforated plate elements must be of the correct gauge and must be suitably supported and reinforced where necessary, particularly on large elements. For fine straining and filtering, woven wire mesh is used which must always be adequately supported. 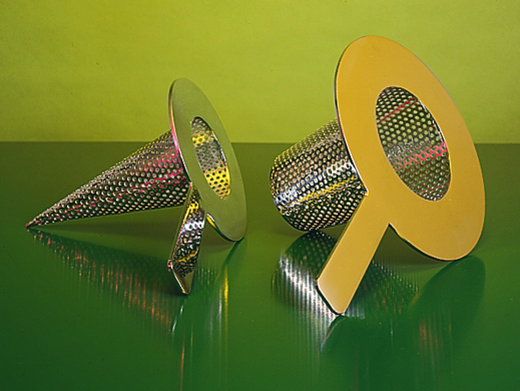 It has been known for some manufacturers of less repute to install mesh screen in Y-Type strainers without any support whatsoever, this results in a service life in many cases of less than a minute, since the first pressurisation bursts the screen. Also effective sealing of the ends cannot be achieved because of its unstable construction. All GFSA mesh lined screens and baskets are supported by perforated plate support structures to form an integral one piece fabricated units. It is very important that the wire mesh be integrally and tightly fastened at both ends and also at suitable intervals along its longitudinal length particularly at the seem which must be suitably overlapped. GFSA products are double overlapped to prevent any bypass of the mesh. Some manufacturers offer replaceable mesh lining inserts claiming that it is more economical to purchase a spare lining insert than a complete basket. On the surface this seems to be a reasonable proposition, however, since the insert does form an integral part of the basket its support is very much limited, which in most cases leads to a quite considerable reduction in service life as the insert is more susceptible to damage and failure. Extra sealing surfaces also increase the possibility of fluid bypass. GFSA products, therefore, favour the one-piece integral unit, as these generally have a longer more efficient service life. One piece elements can also be refurbished with new linings at a fraction of the cost of a new unit, which GFSA will gladly undertake for their clients with exceptionally quick turnaround times. A screen or basket element must incorporate good sealing surfaces since its ability to retain particles will be only as good as its seal. A poor or inadequate seal could allow contaminant to bypass the element. All GFSA screens are 100% checked for squareness, and basket rings are machined to a surface finish of 3.2 micron.